At this time of year, thousands of students in universities and secondary schools are either in the throes of doing exams or enduring the anxiety of finalizing their preparations for them. So new research on the psychological stress of academic studying and the unexpected usefulness of last-minute cramming might be seen as particularly timely. Except, that is, for one small problem. 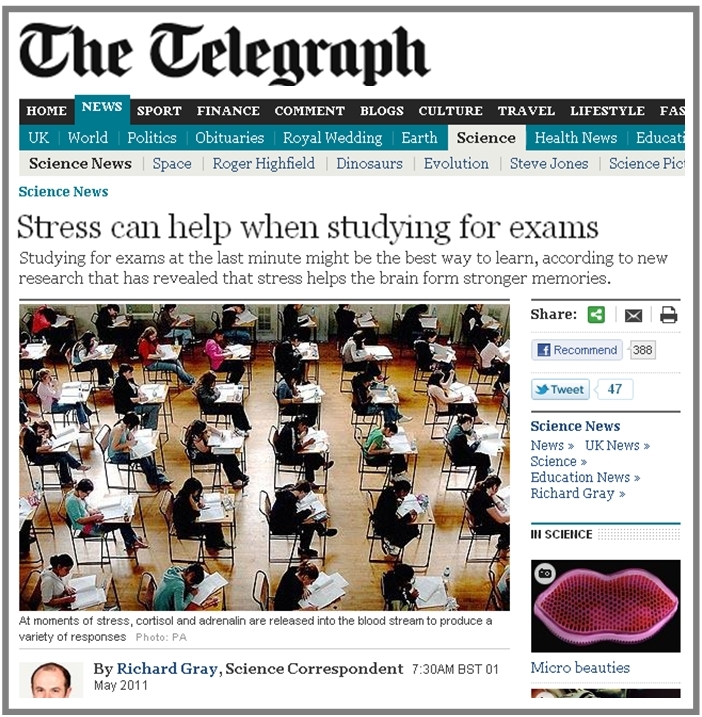 The research in question has absolutely nothing to do with the stress of academic studying. It also has absolutely nothing to do with the unexpected usefulness of cramming. In fact, the research looks not at students at all, but at rats, mice, and other animals; and examines not the stress of academic studying, but experimental stressors such as being forced to swim in a water maze or having an electric shock applied to the foot. Generally, we should be sympathetic to news reporters when they are presented with highly complex research studies that they must describe to lay audiences. In an effort to make things comprehensible, journalists will often attempt to encapsulate the work within an easily grasped metaphor or to extract some practical application of the findings, even if only tenuously supportable by the data. Typically, stories are discussed in the context of a media frame (namely, a socially relevant topic that can be used as context), and are often linked to extraneous news events known as media triggers (for example, to the fact that right now students are currently involved in exams). However, this particular case – in which highly abstract neurological and genetic concepts drawn from animal research have been cast in terms of college students and examination stress – probably exceeds what is reasonable. The presented narrative is so far removed from the actual research that virtually all the headlines used, and all photographs selected, are essentially misleading. This is quite disappointing because the research itself is genuinely fascinating and worthy of wide dissemination. The paper in question was presented at a meeting of the British Neuroscience Association, and is awaiting publication in the academic journal Experimental Neurology (which has posted an advance version on its website). It is a thorough and synthesising review of a wide-ranging literature, and makes a fascinating and substantive contribution to a key debate in genetics. Its main finding is that psychological stressors may exert strong epigenetic effects that are likely to affect memory formation. In other words, life experiences may influence the way our genes mould and influence our developing biological selves – including those brain areas involved in remembering – in ways that are unrelated to the underlying DNA sequence we inherit from our parents. In typical descriptions of the nature-nurture debate, ‘nature’ gives us our genetic blueprints from which our biological selves emerge, while ‘nurture’ presents environmental influences which help shape our psychological selves (e.g., our behaviours and personalities). However, with epigenetic effects like the ones reported here, ‘nurture’ ends up crossing over to affect gene expression directly. As mentioned above, thus far the main focus of research has been the examination of physical or behavioural stressors in rodents. The Bristol review focused on ways in which such rodent models have revealed the effects of stress on the so-called MAPK/ERK pathway (a chain of proteins that links the receptors of a biological cell to the DNA in its nucleus), on the production of glucocorticoid hormones, and on genes involved in stress-related learning. Overall, the emphasis is on very fine-grained biological pathways that can only be reasonably (and ethically) pursued using animal research. The Bristol group do mention some human studies towards the end of the paper, but only as an annex to their overall argument. These human studies did not examine students and studying, but instead involved persons exposed to particularly extreme psychological stress (for example, victims of child abuse who later died by suicide). Quite how this work ended up being reported in the media as “evidence” for last-minute exam preparation by students is not at all clear. As it happens, the proposition that so-called cramming is a useful academic study strategy has itself been researched. While the accumulated evidence is almost inevitably qualified by caveats (as it can never be said to encapsulate all academic disciplines, assessment methods, student learning styles, or time factors), the general picture appears to be consistently that cramming is a particularly poor way of preparing for exams. ‹ Skeptics vs. Quacks: Who’s winning?